Oct. 14, 2014, 11:12 a.m.
With about 50 million unique visitors in September, Time has more than doubled its uniques in the past year. By Joseph Lichterman @ylichterman Oct. 14, 2014, 11:12 a.m.
t was a Thursday in late August and the Internet was whipping itself into a frenzy. The cable channel FXX was about to kick off its Every Simpsons Ever marathon, showing all 522 Simpsons episodes back-to-back-to-back. And in its daily meeting that morning, Time’s audience engagement team was figuring out how to best take advantage of the moment and convert interest in the Simpsons into visits to Time’s website. Time, together with sister site Money, published at least five different pieces on the Simpsons marathon on that day alone. “Simpsons stuff, that feels like it’s going to be big for us, so with cameos, let’s make sure we get gifs for Tumblr — I feel like that could be fun,” said Callie Schweitzer,” Time’s director of digital innovation, speaking quickly and in story slugs, as she kicked off the meeting. “‘Here’s how long it’ll take to binge’ — that’ll be great. I would also say that we should try and pursue that external voice. If we got Hank Azaria or someone who did a cameo to write something for us, that would be so much fun,” she said. “We’ll also re-promote Jim Poniewozik’s piece that did really well a couple of months ago,” interjected Ashley Ross, Time’s audience engagement editor. Time’s editors meet every morning at 9:45 to discuss stories for the upcoming day. After that meeting, Schweitzer, Ross, and Borchers gather to discuss the 15 or so stories they plan on promoting heavily and how they’ll use what Time calls its “external levers of distribution” — which range from its daily email newsletter and cross-promotions on other Time Inc. websites to working with the Time Inc. PR department and, of course, social media — to ensure that their stories are widely read and shared. Of the three, Schweitzer is the longest tenured Time employee, having joined the company all the way back in August 2013, and their roles are emblematic of Time’s revamped digital strategy. Time had about 50 million unique visitors in both August and September, more than doubling the roughly 20 million it attracted the year before. Their efforts go beyond social as well. 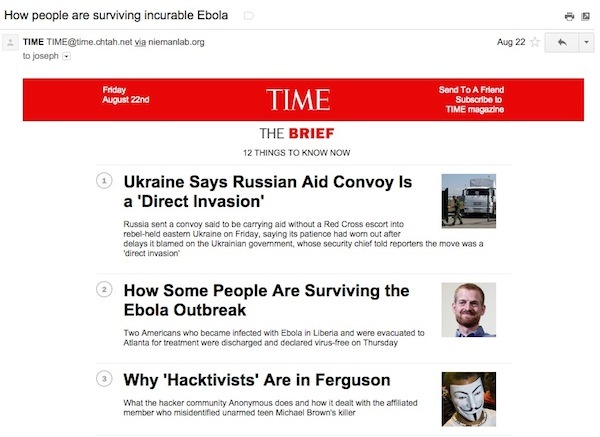 The Ebola story discussed that morning, covering how some people are surviving the virus, was the top story in Time’s daily email the next morning. Called The Brief after the central feature of Time’s homepage, the email lists 12 things readers need to know each day, and it has an average open rate of around 40 percent. Time has more than 6 million likes and followers on both Twitter and Facebook, but Time assistant managing editor Sam Jacobs said the newsletter, which has about 650,000 subscribers, can drive significant traffic. “We can just watch in the morning, as we monitor Chartbeat, that our newsletter has the effect that a great pickup on social, on Facebook or our Twitter feed, which is very large, [has],” Jacobs said. The cover package of September’s issue of Money magazine was based on a simple premise: What would you if you had an extra $1,000? And on that late August Thursday, Time’s engagement editors were discussing the best way to promote the package. “They sent me PDFs…so I read through them and I sent them a bunch of social language, because both packages are super evergreen,” said Borchers. “Also pegged to what to do with $1,000 is also what to do with $10,000 and really smart things to do with $100,000. So I’m going to tell them that, when we share those, we really need to use the conditional tense — because if we don’t, the top comment every time is going to be I don’t have $100,000,” Borchers continued. “So it’s going to be more of a fantasy thing of what would you do. 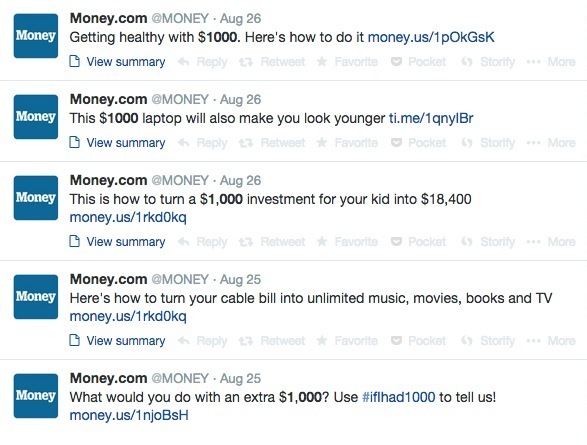 Along with a social media barrage from Money itself, links to the stories were also shared by Money’s Time Inc. sister publications Time and Fortune. The social push was all part of a very coordinated effort organized by Time’s audience engagement editors. Words like synergy and collaboration get thrown around whenever there’s a new media merger — like the ones that produced Time Warner in 1990 and AOL Time Warner in 2000. But today’s media world is one of spinoffs, not mergers: Time Inc. was surgically separated from Time Warner earlier this year. And it’s that spun-off reality, with its layoffs and belt-tightening, that is pushing for closer collaboration and integration between the remaining magazine brands of Time Inc.
Time released a new responsive website in March, and it has boosted the amount of content it posts as it now publishes about 150 stories each day, from reported news stories to short, quick-hit, posts with embedded videos that show things like the latest “hilarious” or “flawless” John Oliver hot take. Time now has a global breaking-news desk staffed around the clock with reporters and editors so they are able to respond to news at all hours of the day and continuously produce new content. There’s even an audience engagement editor based in Hong Kong who manages Time’s homepage and content promotion overnight in the U.S.
“We inherited a site that had a good audience…and a lot of good content, but what we wanted to make it really, and we overhauled the structure and staff and process to achieve, is the sort of minute-to-minute embodiment of the magazine,” said Edward Felsenthal, Time’s managing editor of digital and a founding editor of The Daily Beast, who was brought on in March 2013 to lead this effort. “To do 24/7 what Time has always done for the week,” he said. Early on August 21, Time released the cover for its next issue, which was on the protests in Ferguson. But the cover package of stories was barely discussed during the smaller meeting that morning, as many of the pieces in the magazine had already been published online earlier that week. Basketball hall-of-famer Kareem Abdul-Jabbar, who writes a regular column for Time, wrote a piece on Ferguson that was Time’s most trafficked story in August, according to Felsenthal. 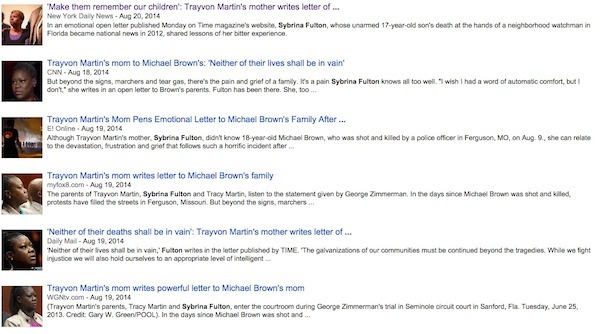 Sybrina Fulton, Trayvon Martin’s mother, also wrote an open letter to Michael Brown’s family in Time. Fulton’s letter was picked up widely by other outlets after it was published, and that is partially a result of a concerted effort by Time’s public relations office to ensure that the letter was seen by outlets who might be interested in writing about it and, importantly, linking back to Time’s original post. That type of PR push is not uncommon. Daniel Kile, the vice president of communications for Time, Fortune, and Money, or one of his staffers attends every morning editorial meeting, and they make a point of knowing they’re aware of what content is coming on the editorial side. Time’s social media accounts are controlled by the editorial staff, but the PR side is intimately involved as well. And with its revamped editorial approach, Time is nearly platform agnostic, Kile said. The big stories used to be those that were on the cover of the magazine or in print, and that’s what the PR team would promote. But that thinking’s changed: Fulton’s letter, for instance, was posted online for nearly a full week before it appeared in the print edition of the magazine. Ultimately, though, no matter the medium or platform, Time’s goal, like any other mainstream publisher’s, is to get its content in front of as many pairs of eyes as possible. “However we can infiltrate people’s habits, or think about different ways of delivery, discovery, optimization, packaging, or just reader engagement, we want to do it and we want to try it,” Schweitzer said. 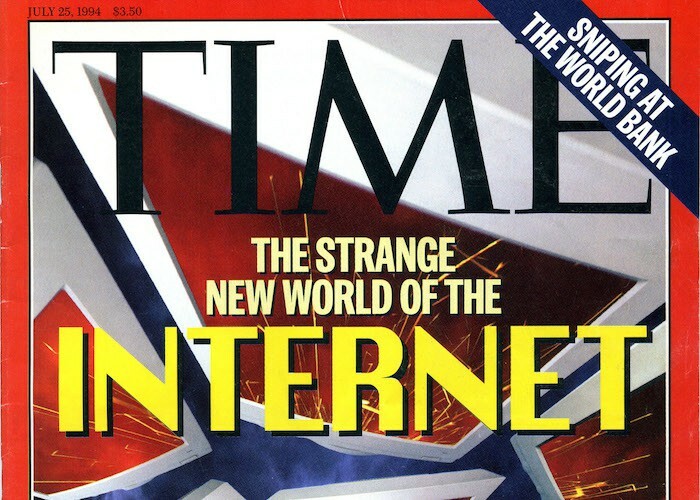 Photo of the July 25, 1994 issue of Time by Dave McLean used under a Creative Commons License. POSTED Oct. 14, 2014, 11:12 a.m.
Lichterman, Joseph. 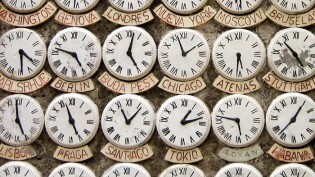 "Infiltrating people’s habits: How Time works to engage readers." Nieman Journalism Lab. Nieman Foundation for Journalism at Harvard, 14 Oct. 2014. Web. 18 Apr. 2019. Lichterman, Joseph. 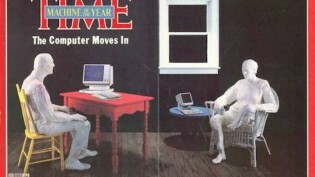 "Infiltrating people’s habits: How Time works to engage readers." Nieman Journalism Lab. Last modified October 14, 2014. Accessed April 18, 2019. https://www.niemanlab.org/2014/10/infiltrating-peoples-habits-how-time-works-to-engage-readers/.